This is Grub with some extensions to its crypto modules to enhance the support for DMCrypt and LUKS volumes. 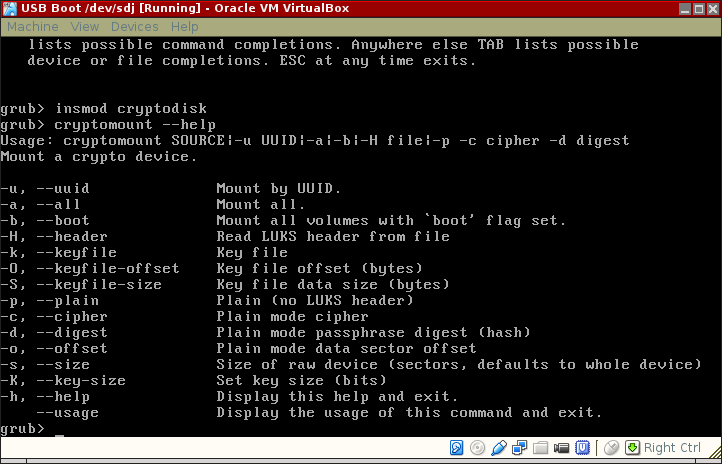 The Grub cryptomount command can mount LUKS volumes. This extension augments that capability with support for detached headers and key files as well as adding support for plain DMCrypt volumes. This makes it possible to boot from LUKS and DMCrypt volumes. The LUKS header may be detached and stored on a separate device such as a removable USB key. Key files may be stored in a similar way and used instead of interactive passphrase entry. allow a crypto volume UUID to be specified with or without embedded hyphens. give the user a second chance to enter a passphrase after failing to unlock a LUKS volume with a given passphrase or key file. The extension provides the cryptomount command with several new command-line options. Use cryptomount --help to display them. The options parrallel those offered by cryptsetup. This work has the same license as Grub (GPL v3). Follow the build and install instructions in the upstream Grub INSTALL file. Patches compatible with upstream HEAD (28b0d190) at time of writing, 2018/03/14. Patches 6 and 7 are contributed pull requests. The cryptomount command can identify an encrypted LUKS device by its UUID. The UUID value can be specified with or without being delimited by hyphens. Because the given UUID is compared against the UUID in the LUKS header, such lookups only work with LUKS volumes with attached headers. Specifically, the UUID cannot be used with plain DMCrypt volumes or when a LUKS detached header is used. A key file contains the cryptographic material required to unlock a volume. This is a passphrase for a LUKS volume or a key for a plain volume. The required data is usually read from the beginning of the given file but the offset command-line option allows it to be read from within the file. When used in plain mode, the amount of data read is the number of bytes required for the key and an error will occur if insufficient data can be read. These options can be used together to embed a key or passhrase in a larger file. A key file may be either a file (-k (hd0,1)/keyfile) or a raw device (-k (hd0,1)). Thanks to @giddie for the patch. This extension does not alter Grub’s automated configuration (e.g. grub-mkconfig) in any way. Use of the extended options will require manual configuration of grub.cfg. This example assumes the default cipher and passphrase hash. These defaults are the same as the ones in cryptsetup: aes-cbc-essiv:sha256 and ripemd160 passphrase hash. This example opens a LUKS volume using plain DMCrypt. The volume master key is read from a file and the LUKS cipher and payload offset details are supplied as parameters. This example opens a LUKS voume and is the only method supported by upstream Grub. The device may alternatively be specified using the UUID contained in the LUKS header. This example opens a LUKS volume using a detached LUKS header. 6. LUKS with a 50 character passphrase embedded 30 bytes into key file. Read A GRUBby USB Stick for supplementary information, including a way to create a USB boot stick to boot encrypted filesystems.